Crumbles have to be one of the easiest desserts to make. For those unfamiliar with what a crumble is, it's generally soft fruit with a crispy topping of a flour and butter mixture. The most common crumble is apple crumble. Imagine an apple pie without the pastry, which is replaced by a sweet crumbled biscuit topping. So why do I love crumbles? Pre-prepared crumble can be stored in a ziplock baggy and frozen for an eternity, or until whenever you have a hankering for fruit crumble or too lazy to make any other dessert. And you don't even need to use fresh fruit. Canned fruit or canned pie filling may be used, which in this case, I have. If you prefer to use fresh, slice and layer the fruit in your dish and add sugar to sweeten. Use 3-4 tablespoons of water for harder fruits (eg. apple)/no water to 1 tablespoon for softer fruits (eg. berries). Bake in the oven for 10-15 mins before sprinkling the crumble on top to bake further. To make the crumble, shift the flour, cinnamon, nutmeg and sugar into a mixing bowl. Add the butter, using your fingertips to rub it into the flour mixture until the mixture resembles coarse breadcrumbs. Pour the can of fruit into a baking dish and stir in the honey. Sprinkle a generous layer of the crumble on top. Bake in a 180ºC oven for 30 mins or until golden brown. Serve with cream, custard or ice-cream. that looks really good, i'd be sure to try that one day! Try it with any fruit you've got, except durian. The crumble lasts forever in the freezer and if you shove it in a ziplock baggie, it doesn't take up much room at all. Maybe jackfruit crumble might be nice. 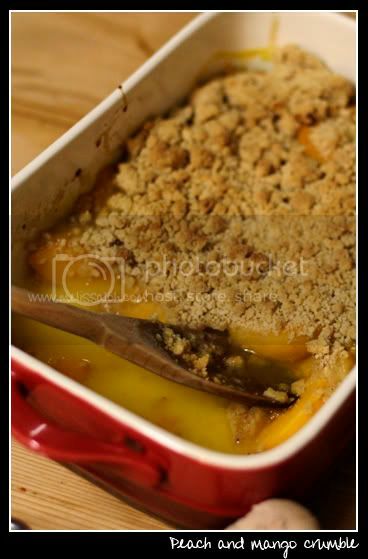 You had me at "Mango"
I just made apple crumble! Now you've got me wishing I tried mango instead! I think mangoes are currently in season, so you can definitely give it a go.